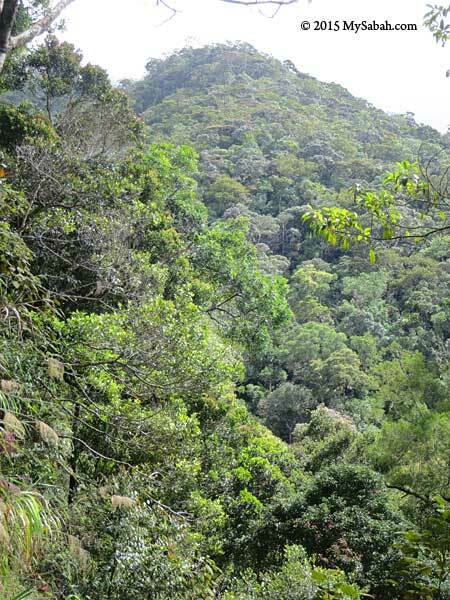 (Update: Mesilau Trail is permanently closed, and day hike to both Timpohon and Mesilau trails is no longer allowed) The space to climb Mt. 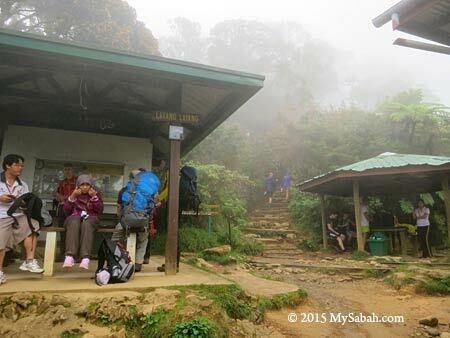 Kinabalu is always full, so many tourists don’t have the chance to climb the highest mountain of Malaysia. Don’t be disappointed if you are one of them, because you still can try Loop Trail, which allows you to hike up to 2,745 Meters asl (asl = Above Sea Level), about half the height of Mt. Kinabalu (4,095M). The height of Mt. 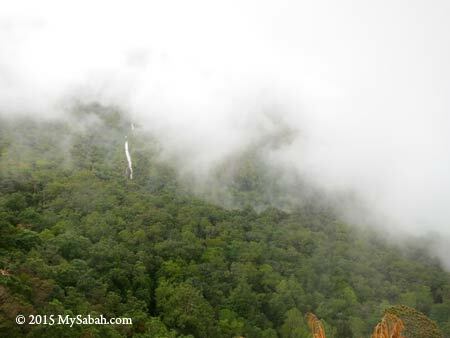 Kinabalu is not the reason why it’s listed as a UNESCO World Heritage site. 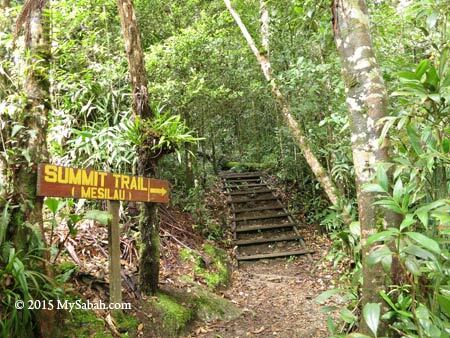 The real treasure of Kinabalu Park is its high density of endemic flora & fauna, which you can see along the Loop Trail. 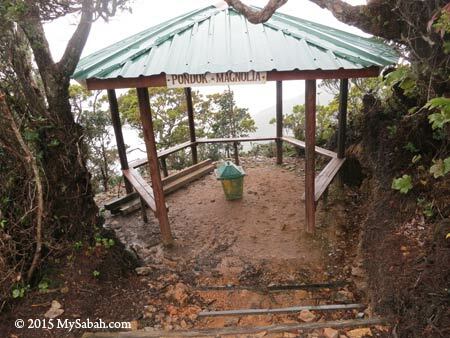 I would say it’s one of the Best Hiking Trails in Malaysia. 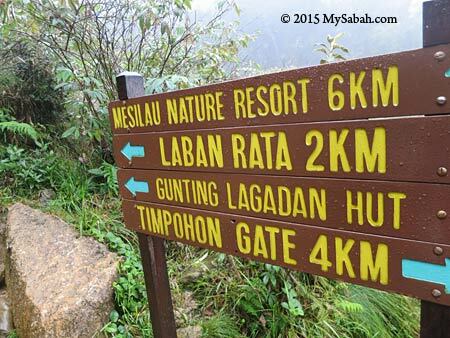 You can pick one of the starting points for Loop Trail, namely, Timpohon Gate and Mesilau Gate, and both trails join at Layang-Layang after 4 KM (2.5 Miles) and 6.2 KM (3.9 Miles) respectively. 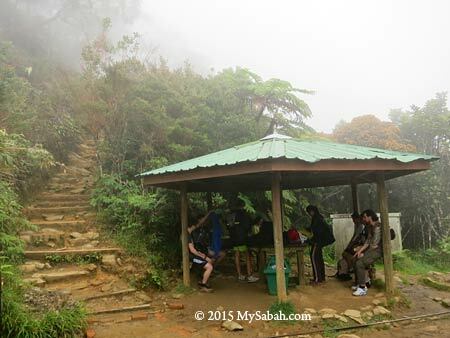 At Layang-Layang, Loop Trail visitors have two options, (1) turn back to where they begin, or (2) proceed to another Gate. Loop Trail visitors are forbidden to take the Summit Trail after Layang-Layang, and no, you can’t camp in the shelter. Timpohon Trail is shorter and easier, Mesilau Trail is longer but the view along this trail is more beautiful (EVERYONE says that). 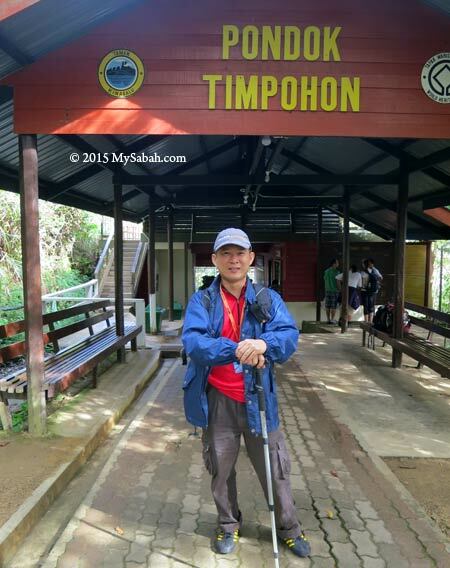 Timpohon Trail is mostly uphill trail so descending is fast and easy. In contrast, Mesilau Trail is a series of ascending and descending trails, so turning back is almost as challenging as going up. Anyway, it’s not mandatory to finish the loop trail. You are free to stop at any time and head home. Timpohon Gate → Layang-Layang → Timpohon Gate 8KM (5 Miles) The Easiest route, take 3 to 5 hours. 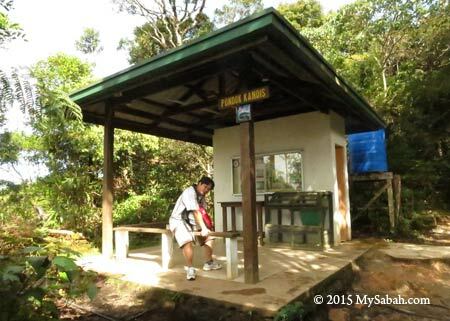 Mesilau Gate → Layang-Layang → Mesilau Gate 12.4KM (7.7 Miles) Hardest route. May need over 7 hours. You have to be very fit. Some trail runners do this loop as a training. *The number of hours taken is highly dependent on your physical fitness. 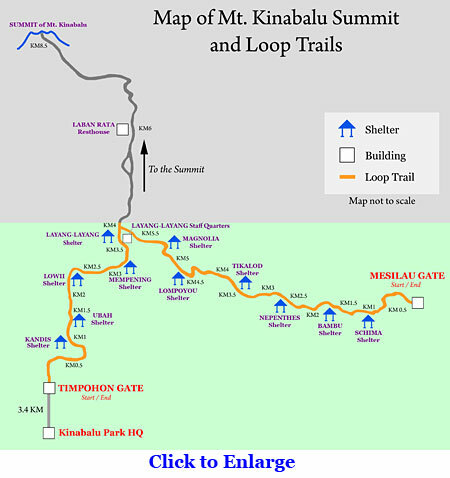 Though Loop Trail ends at the altitude of 2,745 M (9,006 feet), you already reach a height taller than the second and third highest mountains of Malaysia, i.e. Mt. Trus Madi (2,642M) and Mt. Tambuyukon (2,579M)! 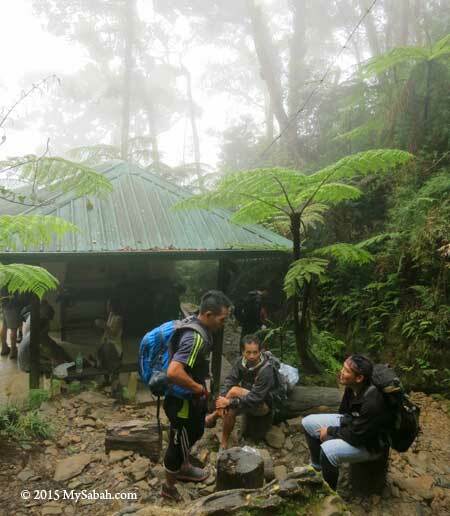 Overall, along the trail there are shelters with toilet, water tank to refill water (it’s untreated water from mountain stream, use water purification tablet if you have sensitive stomach) and support such as stairway, hand rail and wooden plank. The trail is well-marked and there is no leech (a blood sucking critter), bear and Bigfoot. 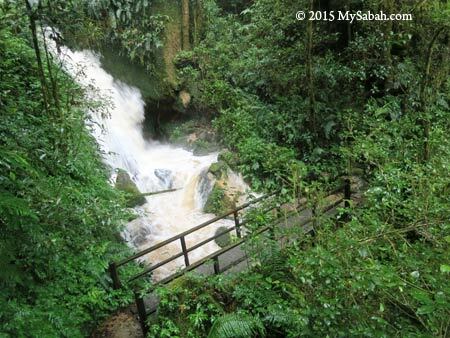 Flora & Fauna Watching: you will find exotic orchids and pitcher plant next to the trail. Some plant may look ordinary but they can’t be found in other parts of the world. Don’t pluck or collect anything. It’s an offense in national park. Photography: The majestic landscape, lush forest, pretty flowers, etc. are good subjects for photo taking. Or just sit and watch, enjoy the nature. A few squirrels will come near to you. Temperature drops every 1°C for every ascending of 100M, so it’s cooler the more you move up. The temperature ranges from 16 to 25°C (61-77°F), but it can be quite warm in daytime, especially in a vigorous walk. Be warned though, the trail would turn into creek during heavy rain and the experience could be quite awful. 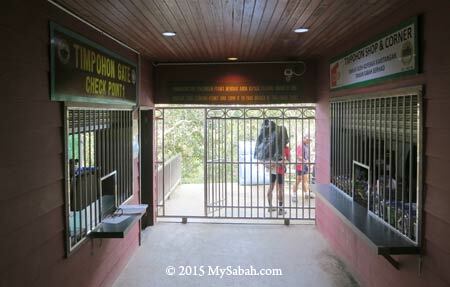 The climbing fee for Loop Trail is RM5 for Malaysian and RM10 (≈US$3) for foreigner. 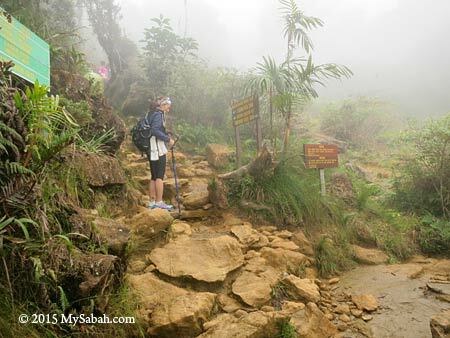 You MUST hire a Mountain Guide (from Sabah Parks) to go with you. The service of a Mountain Guide costs RM203 (≈US$57, rate of year 2015) per day and he can bring up to 6 climbers, which means you can share the guide fee with other hikers. For example, there is a group of 6 foreigners, each of them needs to pay RM10 climbing fee and share the cost (about RM34) of hiring one Mountain Guide, so each person only spends RM44 (≈US$12.22). If you go solo, you still have to pay the full amount. Pic: This is the tag (permit) for Loop Trail visitor. The tag for Summit Climber has photo of Mt. Kinabalu imprinted. 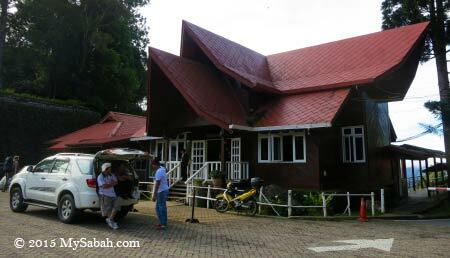 Pic: Kinabalu Park HQ. The registration and payment counter is behind this building, and you can hire transport to Timpohon Gate in the small office at the left. 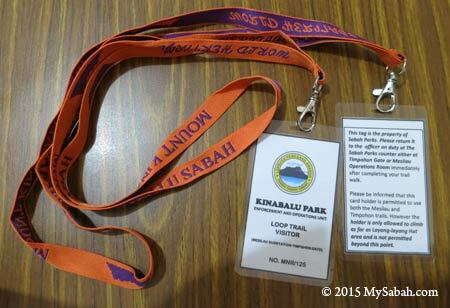 If you start your Loop Trail from Timpohon Gate, you can register and hire your Mountain Guide at Kinabalu Park HQ. Passport or MyKad is required for the registration. 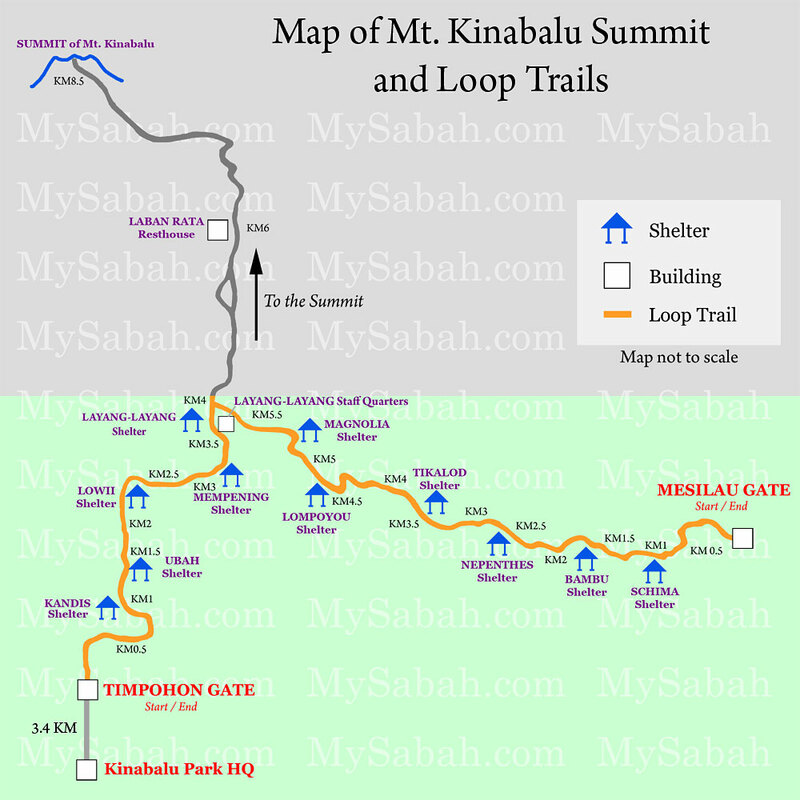 Please note Timpohon Gate is 3.4 KM (2.1 Mile) away from Kinabalu Park HQ (by asphalt road) so you may want to hire a (one-way or return) transport to send you there. 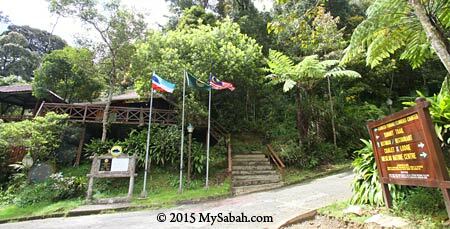 The phone number of Kinabalu Park HQ is +60 88-889888 in case you have more questions. 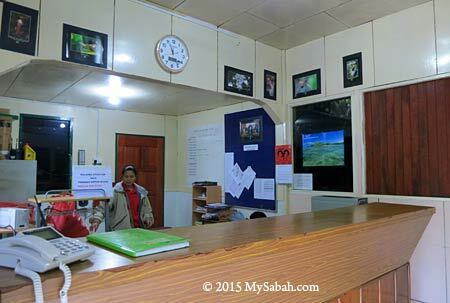 If you plan to depart from Mesilau Gate, you better inform the Sabah Parks office there by phone (+60 88-871550) so your Mountain Guide will wait for you at Mesilau (as most of them stations in park HQ). 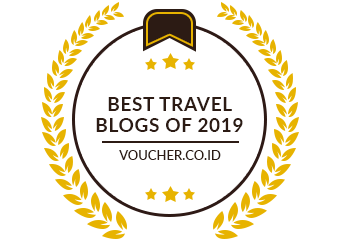 For those who can afford to pay more for a better experience, you may hire tour guide (from travel agent, someone who has good knowledge on flora & fauna). Please note all payment is by Cash Only. Below are some photo walk-through so you know what to expect. Timpohon Gate is the trailhead for Timpohon Trail, which is busier and shorter than Mesilau Trail. You will see many climbers start their summit trail here. Porters also use this path to carry supplies (e.g. tourist’s luggage, rice bag, gas tank, water tank) to the accommodation on mountain. Pic: Timpohon Gate. You can buy snacks, drink and basic supplies (e.g. raincoat) in the building. Pic: You need to show your tag (permit) to the Checkpoint at the left, before you hit the trail. 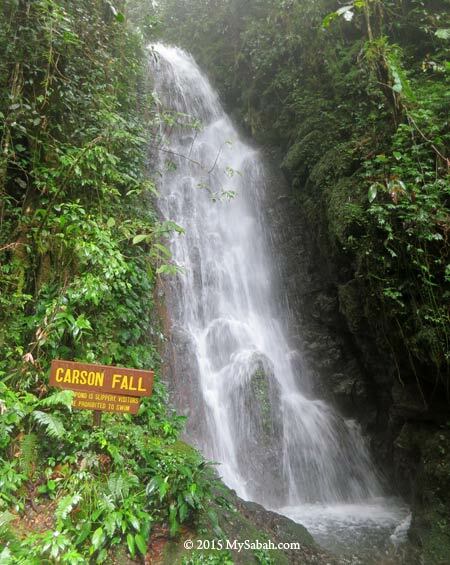 After 300M, you will see Carson Waterfall at your left. If you see large volume of water, it might be raining in higher ground. 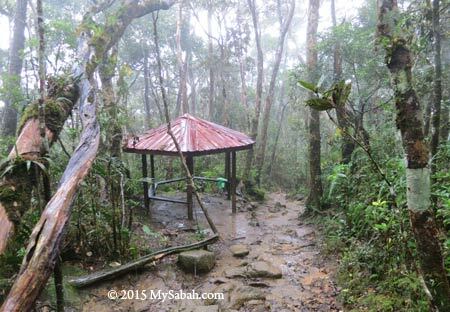 Pic: the first shelter you will reach is Pondok Kandis (Pondok = Shelter), which is named after an edible but sour mangosteen (in Dusun language). 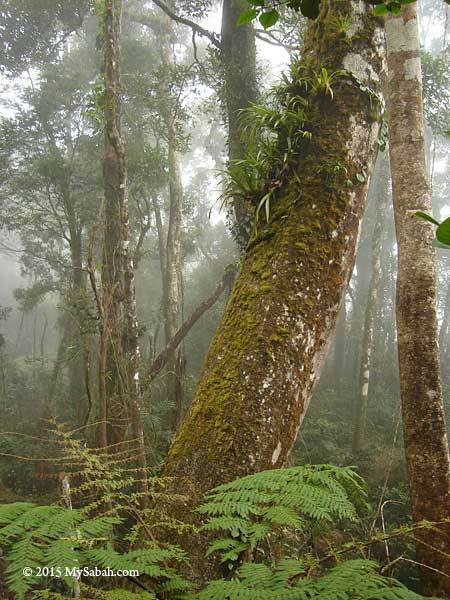 At 1,981.7M asl, you are in the transition zone between lowland rainforest and montane cloud forest, where you start to see mosses, ferns, orchids, etc. Most of the time you will walk on the ground mainly consists of metamorphic rocks from here to Mempening Shelter. 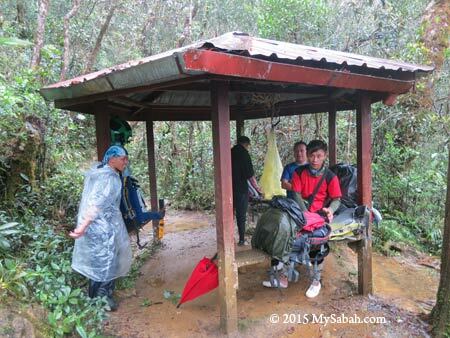 Pic: Ubah Shelter, the 2nd shelter at 2,081.4M asl, it’s named after wild guava tree. 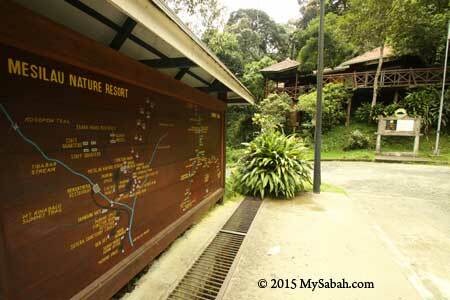 The signage says red leaf monkey could be spotted around there, but I never see one. You can enjoy the scenery better than other climbers as you are not in a hurry to conquer the mountain. Just relax and enjoy the beautiful surrounding. 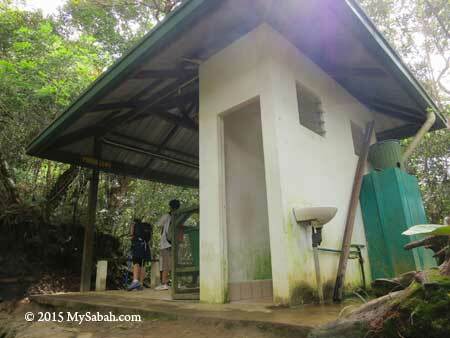 Pic: 3rd Shelter, Lowii Shelter at 2,267.4M asl, which is named after Nepenthes lowii pitcher plant. You would see some pitcher plant such as Nepenthes tentaculata if you explore the bush next to this shelter. 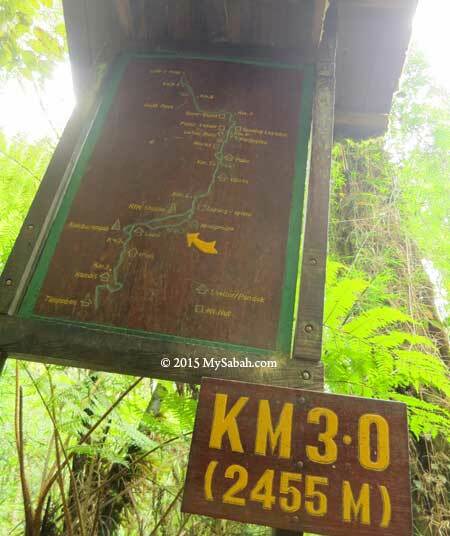 Pic: distance marker (in Kilometer) and trail map to show your current location. Pic: Mempening Shelter (2,515M asl), named after a species of Oak (family Fagaceae). In this shelter, you will hear many climbers start mumbling about the exhausting hike. You can tell them they are not even half way yet LOL. At this point, you have entered the Montane Forest (Cloud Forest) above 2,500M, the surrounding will look misty and mossy, and so distinctly different from vegetation in lowland. Pic: To survive the long trek, you have to to eat whatever you find along the trail, like the giant earthworm that comes out after heavy rain. Just kidding. 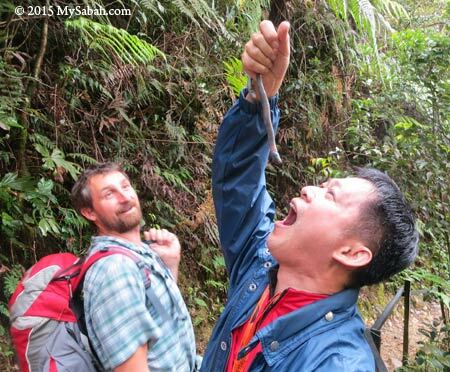 If you are very lucky, you will spot Kinabalu Giant Leech, the predator of giant earthworm. 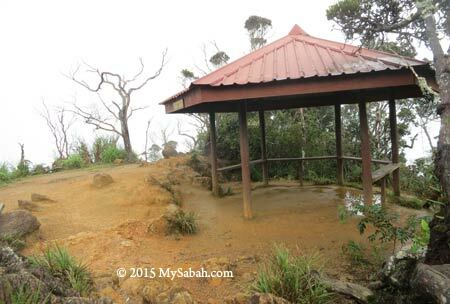 Pic: The last shelter of Timpohon Trail, Layang-Layang Shelter at 2,702M asl, it’s named after a Bornean swiftlet (Collocalia dodgei). This is also where ultrabasic forest begins, which is made up of orange soil that is high in acidity, with high concentration of magnesium and zinc while low in phosphorus. You will see a lot of endemic plant from now on. Unfortunately, you will reach Layang-Layang junction within 10 minutes, where you need to turn back to Timpohon Gate or proceed to Mesilau Gate. 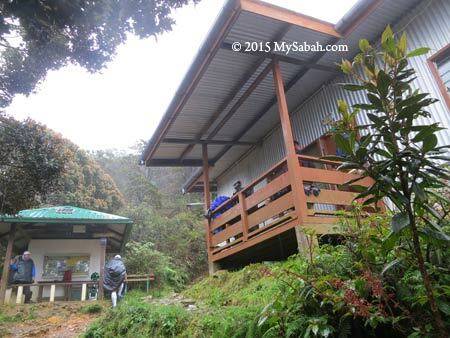 Mesilau Gate is 1,933M asl and located in Mesilau Nature Resort. 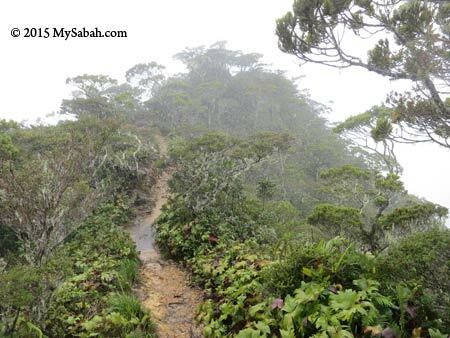 This trail is longer and more challenging than Timpohon Trail, but you will be paid off by nicer view. Only a small number of climbers taking this trail to the summit, so it’s more pristine. The trail is also narrower and not that well labeled. 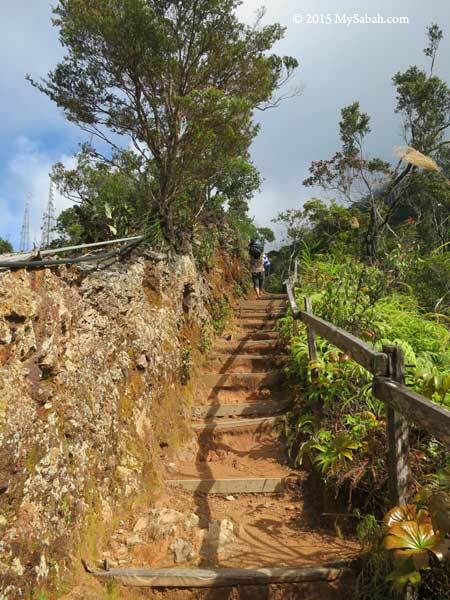 A few sections are steep and slippery (after rain). You will be fine if you are careful. Pic: start of Mesilau Trail. Enjoy the 6.2 KM hike! 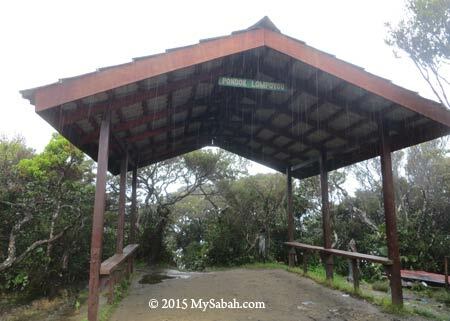 I only tried Mesilau Trail once and it was raining. It was so misty that I wasn’t able to take some good photos to show you. Please believe me that the scenery along Mesilau Trail is better than Timpohon Trail. Pic: Schima Shelter, the 1st Shelter. Pic: Bambu Shelter, the 2nd shelter. In average, there is one shelter for every one KM. 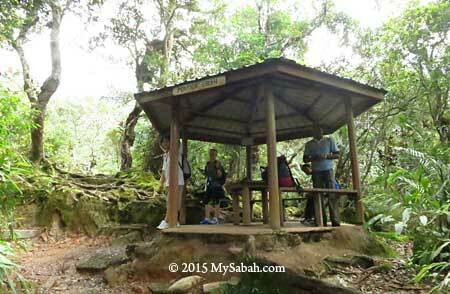 All the shelters on Mesilau Trail are smaller and less developed than those on Timophon Trail. Pic: Don’t ask your guide how many KM left. You will always get the same answer, “We are near”. Read the distance marker. Pic: There are some viewpoints in open area. Too bad the view was obstructed by dense fog during my visit. After 6KM, you will reach the Layang-Layang junction, where you should descend to Timpohon Gate or turn back to Mesilau Gate. 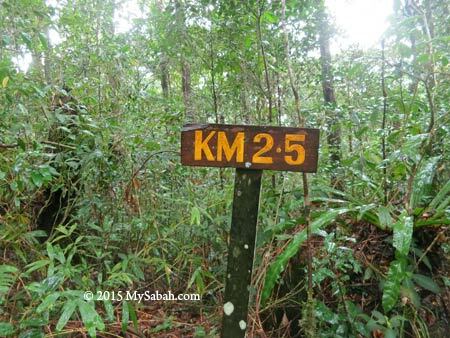 Layang-Layang is the meeting point of Timpohon and Mesilau Trails. The summit trail beyond this junction is off limit for Loop Trail visitors. Pic: warning to visitors without permit. Pic: Layang-Layang Shelter. The Layang-Layang junction is less than 10-minute walk further up. 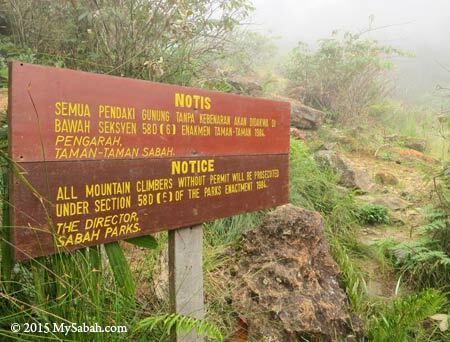 Pic: final warning to climbers at Layang-Layang junction. 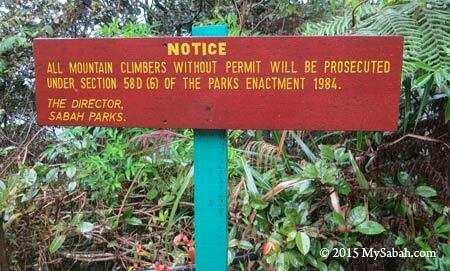 You are not allowed to move further up if you don’t have the permit to climb Mt. Kinabalu. The following is a list of items you should bring. Try to pack light. When you climb a mountain, you can feel every Kilo of the weight. Also, wearing comfortable hiking shoes will help a lot (best if it’s water-proof).